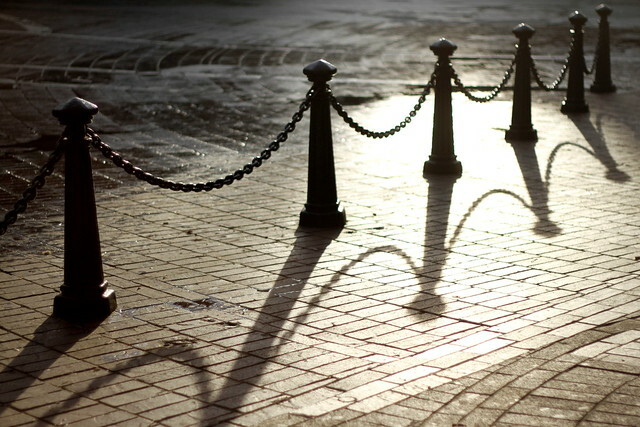 There is nothing quite like sunshine after the rain, especially in a city as wet as Vancouver. 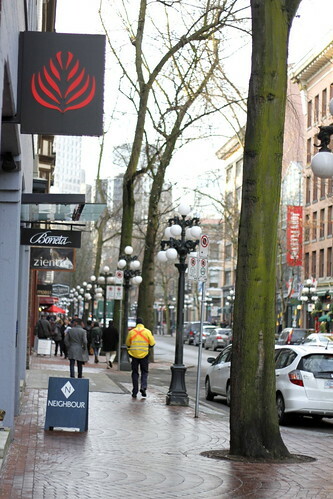 We were recently blessed with a week of sunny skies, and I was happily able to do one of my favourite things in the city: grab a good latte and spend the afternoon exploring Gastown. And on this particular day, even in this non-weather appropriate outfit, I actually kind of felt – dare I say it? – warm! Here’s to the slowly but surely approaching spring season and the optimism that it brings. Happy Monday! Happy Monday! Great pictures you look so happy to have some sunshine. The boots/pants combo makes your legs look like they go on forever! Such a flattering, adorable outfit! So pretty!! I love the gingham and tweed!! Yay for sunshine! I am thankful to live in such a sunny state, but I love it when it rains, too. It’s been rainy the past couple of days, which has made it a challenge to get out of bed. I just wanted to cuddle with Pooma under the covers. hahaha. 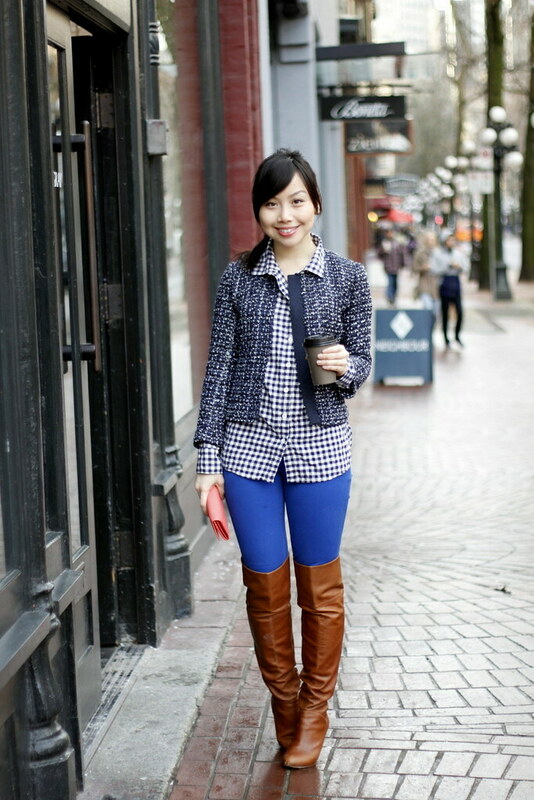 I love the mix of gingham and tweed. I’m totally lusting over gingham right now and even have a green gingham taffeta gown in the works. Here’s hoping my execution of it is spot on! Have a great week, my love. Such a great look. The colour of your pants is fantastic! 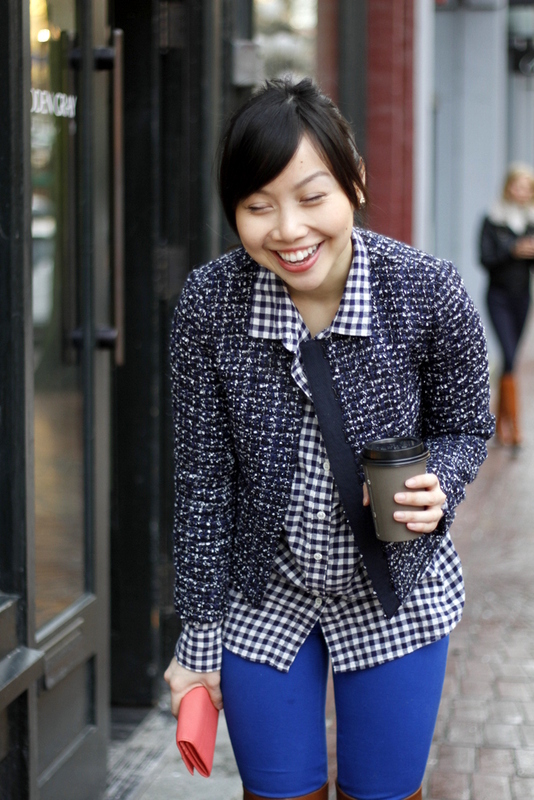 I love how you layered the cropped tweed jacket and the gingham shirt. And those ultra-high boots are amazing! Pretty pics and a great top/blazer combo! Those shoes with those blue pants = AMAZING.The combination of the blue and pink in your clutch is such a great contrast. Love this look! Especially the tweed blazer! So pretty! 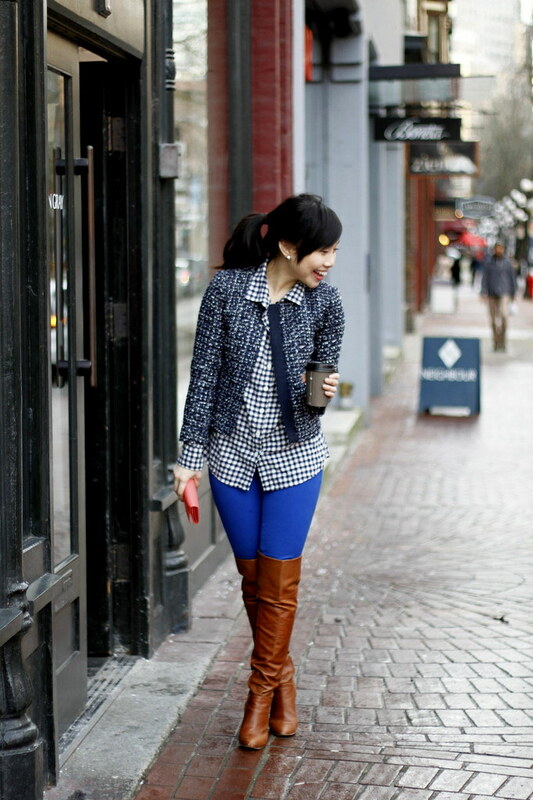 Such a cute shirt & jacket pairing! I love them together! And I’m loving all of these cute giggly photos of you! You are too adorable! wow!! amazing!!! chic from head to toe!! i can’t believe i only stumbled upon your blog now!!! These photos are so adorable and your outfit is just as cute. I know what you mean about being “warm” in this weather we’ve been having. I’ve been trying to get away not wearing a heavy coat and it works on some days! I’m obsessed with your boots too, they’re the perfect colour and height.